A Social Recruiting Survey by Jobvite says 95% of all recruiters and hiring managers search for candidates on LinkedIn. 79% have hired a candidate they found on LinkedIn. So trust me, we are in the era of digital recruitment and you have to be equally prepared mentally as well as digitally "profile wise". 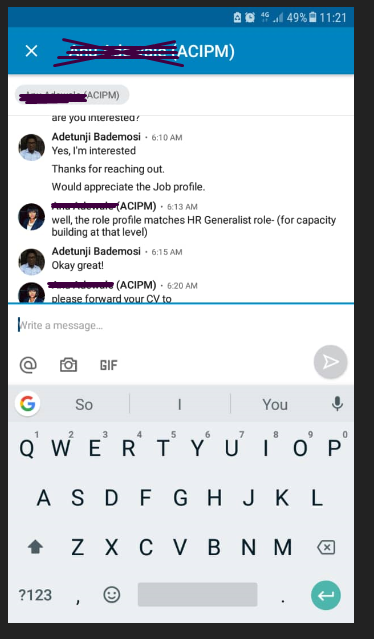 LinkedIn is now your electronic CV. You may have also noticed that sometimes, when you apply for certain jobs, they ask you to upload you LinkedIn URL. Every job seeker must optimize their LinkedIn profiles to enable crawlers pick your profile when talent recruiters and employers are searching for people with your expertise, skills, location, degrees, schools and or discipline. #Perhaps you did not know that I can search for someone who has a degree in Accounting and finished from Bowen. #If I am tipped by a fellow recruiter of a good candidate but I dont have the name except the degree or current employer, there is a way I can fetch this person. LinkedIn works like Google and when you search for something online, the search engine uses crawlers to shuffle through the web, putting into consideration your location, key entries etc and it serves you what you have asked for. This is however made better with some tricks I would show shortly. Imagine that you want to recruit for a recruiting assistant and you type this on LinkedIn, what would LinkedIn serve you? People who most probably have these titles. *What if I want a recruiting assistant that finished from Bayero University?. 1. Experienced engineer with certification as an NSE. 2. 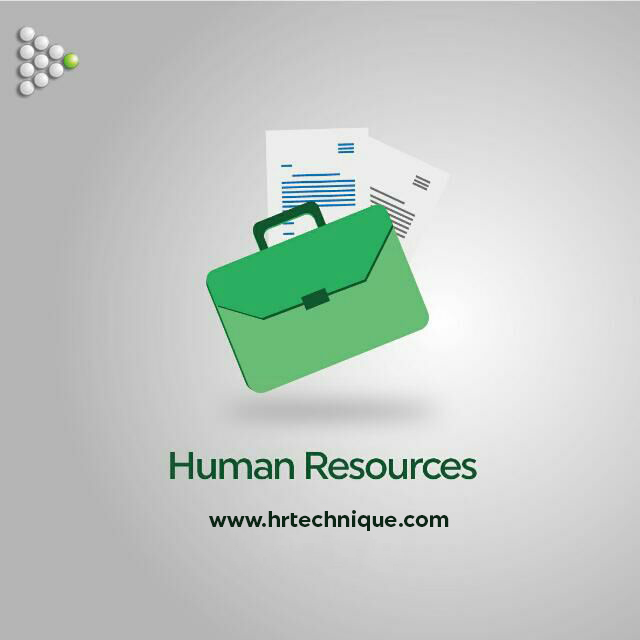 Human resources officer in Lagos. 3. Generalist in financial industry etc. 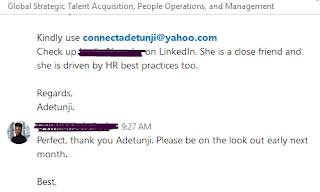 What technique do recruiters use?. This may be new to some of us but I encourage us to read further on what is called the "Boolean technique". This is a type of search that allows recruiters to combine keywords or modifiers such as AND, NOT, OR etc to produce relevant results. Don't worry I will explain. I had recently gone through a recruitment process that exposed me to this technique so please it's not magic. I learnt it too. If you know what card your opponent would play you, you would be prepared for it. This means, if we know how recruiters think, it will make it easier for us to optimize our LinkedIn pages. Now that this is established, let us go to Boolean search to understand the techniques recruiters use. Recruiters use quotes to search for an exact job title. Eg: "risk advisor". If this is your career path, let your Headline be Risk Advisor. Recruiters combine modifiers to create complex searches. Eg: risk AND (advisor OR consultant). Please note the AND with OR in caps. Recruiters use AND to include two search terms. Eg: risk AND advisor. I will share how to optimize your LinkedIn but I am sure we are already getting the gist. They are just simple things we can change to make us appear better in searches. For example; if you are interested in working for an NGO, why not include this in your job profile description. Recruiters use OR to broaden a search with multiple terms. Eg: "training coordinator" OR "training facilitator". Recruiters use NOT to exclude a specific term. Eg: "supervisor NOT manager". a. lagos NOT abuja. This totally clear the search of the people in Abuja. Recruiters use a variety of sourcing techniques to find strong candidates for jobs. As a job seeker, you should always compare your profile to your career path and see that it matches your goal. 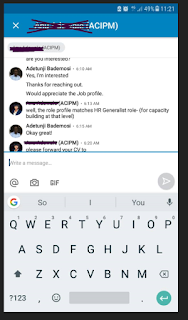 Recruiters also type their keywords (like a job title most especially) into the search box, possibly clicking on some options like industry, location, or other criteria. What are the simple steps you need in order to optimize your profile?. Since I am only limited to what I have tested and know, my tips will not be robust but they have worked for me. Here are some recruiters that have contacted me. So yes! It works. So please... Do the following immediately on your profiles. Don't joke with it. Otherwise, recruiters won't find you. LinkedIn like many other Apps and website uses languages, data collection methods etc that allows it to properly optimize your profile. If your profile is on 60%, what it simply tells the software is that "information is incomplete". You may have seen why LinkedIn keeps telling you to complete your profile. By languages I mean HTML and codes etc. Even if you have the wisdom of Solomon but you are shy to speak, no one would know you are wise. You all will agree with me that your picture speaks a thousand messages. Look bold, stern and professional so that when recruiters find you, you can look what you claim. Images speaks a lot. Grab Attention With an Optimized Headline. a. "Human resources professional in the financial industry"
b. "Risk Advisor | blogger at www.risk.com.ng"
c. "Human resources | Trainer | Writer"
Those are very good job titles. Or if you like, very good LinkedIn headlines. Insert all information NOT complete information 🙂. University of Lagos Nigeria NOT unilag. CIPM - Chartered Institute of personnel management. This helps when looking for specific variables etc. So if I type CIPM or in full, your profile will come up. Take Your professional description/ summary seriously. Include all the necessary key words but ensure it is very professional. Some tech folks believe that a summary of 30 words or more makes it more likely you’ll turn up in searches. Just like we have this group, no one would know you and you probably wouldn't learn anything if you don't contribute. So you may have the best profile and all that but you also have to be very active. You need to put yourself out there. You cannot afford to sit on your hands. b. Your career or job title. d. Your degree and certification. The LinkedIn App/ website is often used by recruiters to find candidates and using LinkedIn SEO is essential today than yesterday. To start with, when you click on edit profile, there is an industry drop down menu. It's important that you populate that part with the right information. Include your industry on your profile. I think that part is important now. Thank you for the audience. I hope we were able to pick a thing or two. This is one of the best article I have ever raed on this platform,thanks for all the explanation and detailed tips keep up the good job.